Turkey will never allow attempts to "extort" natural resources in the Eastern Mediterranean, President Recep Tayyip Erdoğan said on Sunday. 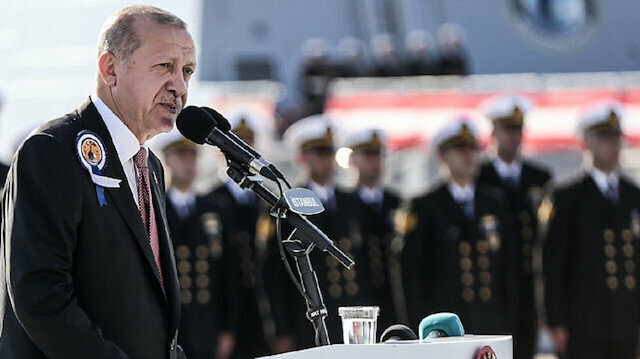 "We will never allow attempts of extorting natural resources in Eastern Mediterranean by excluding us and Turkish Republic of Northern Cyprus," Erdogan said at the delivery ceremony of third ship of MILGEM -- Turkey's first indigenous warship program -- to Turkish Naval Forces in Istanbul. Erdogan said those who thought they could take steps contrary to Turkey in Eastern Mediterranean or Aegean have started to realize they made a "huge" mistake. "We do not have an eye on countries' rights, laws and territories. We only protect the rights of our country and brothers," he added.